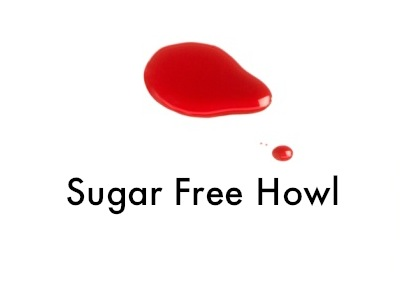 Sugar Free Howl : There are few things that make the human being unstoppable: power, freedom, sobriety, laxatives. There are few things that make the human being unstoppable: power, freedom, sobriety, laxatives. Tonight I was elected squad leader of my Thursday night AA meeting. The responsibilities of a squad leader include directing the meeting through the serenity prayer, announcements, birthdays, and the multitude of texts that preclude the topic of discussion each week. I was a little surprised someone nominated me; I was one of the newest and youngest members of this group. But they told me that because of my dedication each week, my intelligence in regards to sobriety, and my sense of humor be successful for the group, and I gratefully accepted. I first went to this meeting after I was assaulted. I showed up in an oversized hat and scarf to draw attention away from my black eye, and wore gloves to cover the bite on my hand. AA wasn't like I remembered it: over ten years ago, I went to AA in accordance with a fledgling outpatient treatment program in Seattle. In order to not become a liability for underage drinking at my private education institution, I was to undergo outpatient and chemical dependency therapy. Ten years ago, this program failed me miserably. I wasn't ready to be sober, my grades were slipping due to my extracurricular "activities," and the obligation of leaving my friends for Bill W wasn't conducive to my 17-year-old social habits. I was going to AA because I had to. At one point, I was forging my AA slips intended for my squad leaders as proof that I was actually attending. My first meeting in ten years was located in a house in Columbia Heights. Walking in felt like I was walking into someone's home to borrow a cup of sugar. The kitchen was tidy, and fifteen or so chairs horseshoed in the living room. A giant marble coffee table with the AA emblem housed coffee cups, AA literature, even some thawing Girl Scout cookies from the year before. I took a seat in the corner and didn't speak to anyone. At this time, I was on a wait list to go to inpatient rehab at Fairview Riverside. In order to get in the right headspace, I decided to attend a few meetings before submitting myself to those behind hospital doors. I was the youngest person at the meeting. Another member handed me a phone list complete with first names and sobriety dates, some of which were from around the time The Doors and Led Zeppelin were getting popular. I was a newcomer, scared and ashamed. I sat in the corner and tried not to make eye contact. We all stood and held hands for the serenity prayer, which I knew but didn't recite during the start of the meeting. To be honest, I don't even remember the topic of the meeting. I was too frightened to focus or make light of other members' enlightenments. I held my hands in my lap and placed two dollars in the basket when it was passed around to me. The meeting is discussion based, meaning everyone speaks. Around the horseshoe we went, talking about how we were grateful for sobriety and listening various shortcomings. And then it got to me. I choked and cried when I talked. I talked about how if I wasn't drunk, I wouldn't have gotten into physical trouble the way I did. I talked about how I was on a waiting list for inpatient and that I didn't know when I would be drafted. I talked about being more scared and ashamed than grateful. Many members spoke to me afterwards, reassuring me that if I kept coming back, things would get better. Others spoke about how they had went through treatment 12 or 14 times, but that AA steered them right. I drove home in the snow, content I had come upon something I could rely on and contribute to rather than just becoming sober on my own. When I was diagnosed with diabetes, I quit drinking for almost two years starting in 2010. I can do it on my own! Surely I can do it again. And then I slowly started drinking at open mics, dinner parties, and other relaxed occasions. I was laid off from my first real job in 2012, and down I went. Six days a week, I was in the backyard tanning with a stiff whisky drink and no real sense of self-esteem. I was defeated while my unemployed pity party was in full swing. The legitimate struggle has been real for the last two years, and in February of 2015, it came crashing down again, this time with a deafening din. AA has helped me stay sober, however I have a few reservations. There's a lot of god talk in AA, and it took some getting used to. We're supposed to "turn our will and our lives over to the care of God as we understood Him." As an atheist, there is no one to "turn my life over to," and pronouns aren't capitalized. In the Big Book, there is a chapter titled "We Agnostics," which asks you to surrender. But god as I understand him simply does not exist for me. Some have told me to find faith in a Higher Power, a power that is greater than myself and to use that as my spiritual guide through the program. I have a rough time with this aspect. A while back during an outpatient session, we were having a seminar on spirituality which was lead by a backwoods woman who is in recovery and found her calling as a pastor. However, she was asking us to share our experiences with our Higher Powers. Some people shared about how they reach out to their HS to stay sober. But I was fairly dumbfounded when others were saying things like, "Well, I really needed to find a book that was out of print, but low and behold, I found it! And it was all thanks to my Higher Power." To be short and possibly curt, these are not spiritual experiences (to me). Frank Costanza getting the good parking spot in front of the good building is not an indicator of someone watching on him: it's how he perceives it. By scientific law, these are mere coincidences. That long lost book freed up its schedule to be available to the person who needed it, and I doubt there was a third party ensuring its safe arrival. AA asks me to set aside my prejudice, which I do at every meeting. Sally's Higher Power is not my Higher Power, and that's fine. It's my recovery, not Sally's, and I'm going to do what works for me. 1. Admit I'm a mess and I'm in over my head. 2. Maybe I don't have all the answers, so I'll ask for help. 3. Decide to pay attention to advice given. 4. Take an honest look at how I've been living my life. 5. Tell someone else about my unhealthy lifestyle and harm to others. 6. Decide to live a healthier, kinder life. 7. Make specific changes towards those goals. 8. List everyone I have hurt. 9. Have the courage to tell them I'm sorry and make amends, except if doing so would cause harm. 10. Keep an eye on myself, alert to old thinking and behaviors. 11. Be aware of the beauty in the world and in people. 12. Pass onto others the kindness extended to me. That's a list that makes sense to me. I want to be a better person today than I was the day before, and a spiritual guide isn't something that needs to be brought into it, although I understand that it can help other people because we are all different, and thus our needs are different. Overall I'm happy my squad has trusted me to run our weekly meeting. Time for tea and kitty headbutts.